"We let the dog handlers eat lunch with the guns after the tower shoot is over," said the manager of the shooting preserve. "You’ll enjoy it," he continued, "we grill two-inch thick pork chops and my momma cooks up vegetables and cornbread." 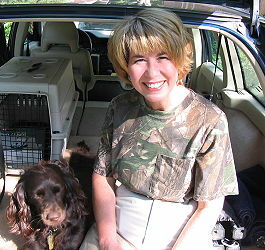 And thus began my first experience working as a dog handler at a shooting preserve. 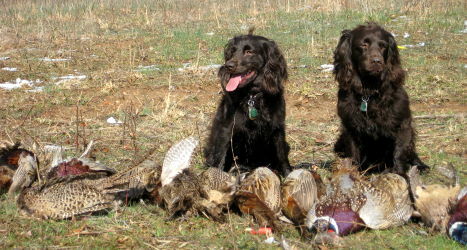 Other Boykin owners had told me about the benefits of working their dogs at tower shoots. 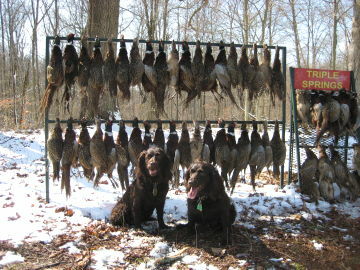 With shotguns blazing, it is a great opportunity to work on steadiness, marking, delivery, multiple retrieves and blinds. Short of water retrieves, it should be a great training opportunity and I was looking forward to the experience. "Man, we loved watching your dogs work," he told Welch. "We got so into watching those little dogs retrieve we forgot to throw the birds a couple of times," he added enthusiastically." 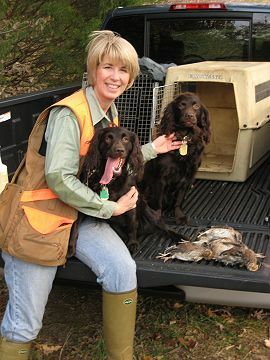 My husband, Welch, had picked up the card for the shooting preserve some months earlier at an outdoor show at Bass Pro Shop and now, with the Boykin Spaniel Society National Field Trial less than 30 days away, the timing seemed ideal. When I called in early March to offer our services I was greeted politely, but with some skepticism: "Spaniels?" and "Are they steady?" 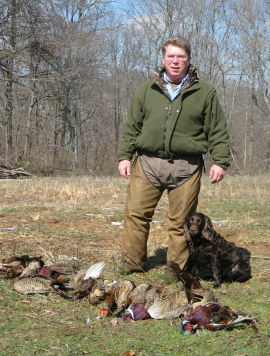 and "You know, some people call and say their retrievers are steady, but when they get here it is another story." I’m sure the fact that I am a woman didn’t lend any credibility to my assertions, but I assured him that if they were a problem, we would put them on lead. The preserve was about an hour south of Nashville and I promised that we would be there by 10:00 AM the following Saturday. As luck would have it, Friday night brought the first and only snowfall of the winter. The next morning, the TV weathermen were advising everyone to stay off the roadways and postpone non-essential travel. "Let’s see," I thought to myself, "is a fantastic training opportunity just three weeks before the national field trial non-essential? ...NOT!" So after receiving assurances that twenty guns were on their way from Mississippi for the last tower shoot of the season, we packed up the three brown girls and hit the road ourselves. Our life began revolving around Boykins with Edie’s arrival in 2002. Since that time, we have been on countless dog-related adventures - both near and far. Welch keeps asking why, since this is my hobby, does he have to work so hard? Bless his heart. So many thoughts were running through my mind as we drove south through ice and snow. With slight adaptation, the line from an old Geritol commercial summed it up best, "My husband, I think I’ll keep him." The unexpected snow delayed the guns from Mississippi, so Welch and I took time to air the dogs and meet the other handlers and their retrievers. They were members of our HRC club, Music City, but as is often the case, I knew the dog’s names but not their owners. Both handlers had worked tower shoots before, so gathered ‘round the fire pit they gave us a preview of what to expect. By this time, the snow had stopped and there was not a cloud in the brilliant blue sky. As the temperature warmed, the dogs raced and played in the snow and we stood together looking out over the snow capped rolling hills of middle Tennessee. Once the car loads of hunters arrived, we headed for the top of the hill where the shoot would take place. Meant to simulate a European driven shoot, guns ring a central point as pheasants are hurled out of a tower and come flying directly overhead. In our case, the tower was at the wooded crest of a hill and ten shooting stations circled the perimeter, approximately 60 yards from the center point. The blinds were constructed of 4’x 4’ posts with a 3’x 8’ sheet of plywood hung horizontally at about eye level. They were designed to camouflage the guns from the incoming pheasants and, for safety, prohibit low shots. We had been concerned for the wellbeing of our dogs, even bringing blaze orange vests for them, but this arrangement allayed our concerns. In pairs, the guns walked to their initial stations and loaded their shotguns. Welch and I really didn’t get as many questions as I would have expected. I guess the hired help is invisible. With everyone in position, a dozen pheasants were released one at a time around the circle and they came flying toward the guns. It quickly became apparent that bringing down a big pheasant screaming towards you at 25 miles per hour was not going to be as easy as everyone thought it would be. The guns kidded each other about missed shots, and couldn’t believe the birds weren’t falling the way that they expected. Our work began when the shooting stopped. The Boykins were handling four stations and it took a sharp eye to keep track of the birds. Some retrieves were simple marks in front of us or to the side, some were blinds, and the most challenging test was to hunt dead behind the guns and down the steep side of the hill. It was a new experience for all of us, and while the girls were steady there was little else to be pleased about. Their retrieves were ragged, delivery was sloppy and there was much confusion about this new game. After a dozen birds were released, a horn sounded and the guns rotated to the next station. The terms of the shoot called for 240 birds to be released and at the halfway point a break was called. As we headed to the fire pit the guide sought us out. "Man, we loved watching your dogs work," he told Welch. "We got so into watching those little dogs retrieve we forgot to throw the birds a couple of times," he added enthusiastically. "Don’t forget to join us for lunch, we’re grilling these great two-inch thick pork chops." Maybe this wasn’t as bad as I thought. The second half of the shoot was much better than the first. As the dogs settled into a routine, the deliveries were crisper, the blinds straighter and hunting dead brought out their natural birdiness. All told, our Boykins retrieved between 30-40 pheasants that day and many of the guns stopped by after lunch to compliment our dogs. And the two-inch thick pork chop was as good as promised.